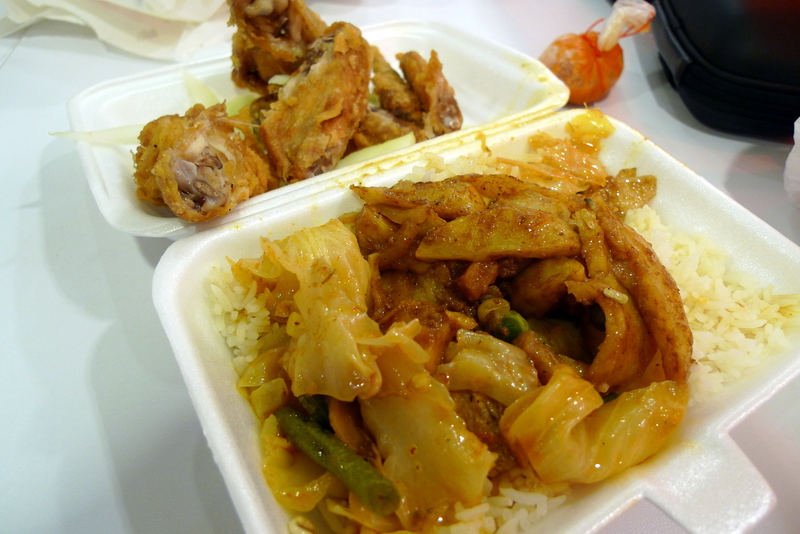 Cheap and good, that’s what most Singaporeans desire right? And that was the picture D painted to me about Tony Cafe, a hidden gem located within The Adelphi @ City Hall. I tried Googling it but to no avail and was slightly distraught that no one else could paint a clearer picture for me. I ended up making a trip down personally and am glad I did, for Monday Lunch to be exact where they served their supposedly famous Fried Chicken Rice Set(only served on Mon, Wed & Sat). Initially, I was a bit turned off by the endless queue, but with 4 of the staff tripling up as scoopers/packers/cashiers, the 20 odd people in front of me were able to buy, pay and collect their nosh within 10min record time. 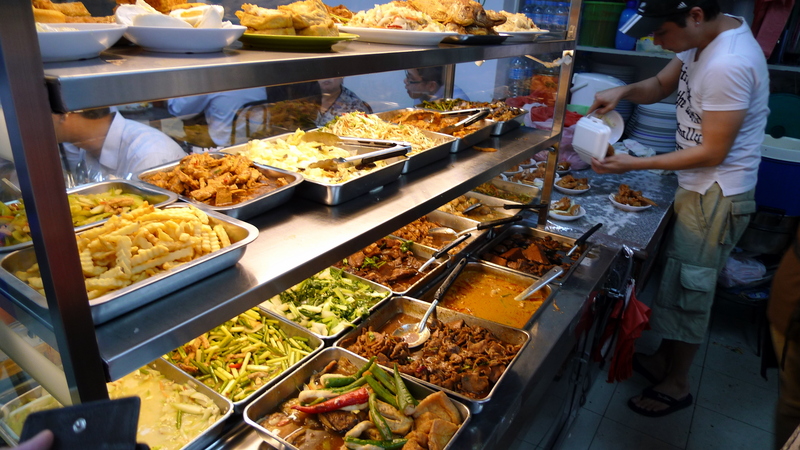 Most customers order take aways due to the limited seating capacity made worse by the staggering lunch crowd(my group went over to Funan’s foodcourt with our takeaways too). Almost everyone else I saw there ordered the Fried Chicken Rice($3) and I followed suit, adding some curry veg and potatoes($0.50 per veg side) as sides to aid digestion future bowel movements(too much info there). 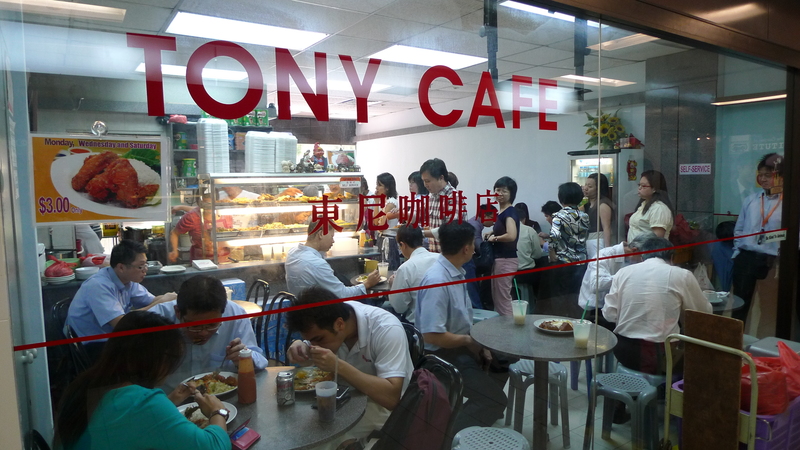 The great thing about Tony Cafe is that they bothered to separate the fried chicken from the chicken rice to prevent it from getting soggy, a nice touch there. And it worked! By the time I reached Funan, my fried chicken(consisting of 2 wings) was still crispy and very palatable with my chicken rice warm and fragrant, something I wouldn’t expect from any other economic rice stall. Oh yea, they do provide the standard chicken rice chili too! Categories : All YumYums in my TumTum, Budget, Chinese, City Hall, Cuisine Type YumYums, Location of YumYum, Yummy! hahaha i salute your courage man! there were times i wanted to snap photos at such places but i was too afraid to do so – for fear of unwanted stares. haha. ANYWAY NICE BLOG PETER! ps: your blog name is catchy. even though i only saw it once the other day, i could remember it effortlessly. n1 la. yea economic rice is cai fan. haha nt everyday can eat gourmet meals ma, must return to our humble roots sometimes. They don’t sell it everyday because they have their awesome BBQ chicken rice on Tuesdays, Thursdays and Fridays, and freaking good meat balls on Tuesdays and Thursdays! They offer a variety of awesome food that leaves people wanting to come by everyday!